While creating the presentation, I remembered a conversation with one of our international clients, who said that, in Europe, “knowledge leader” was the preferred term. The more I thought about it, the more I tended to understand. After all, anyone can have a thought or make you think; not everyone can convey valuable knowledge. So who or what is a “knowledge leader”? Simply put, that person or organization is the go-to for information in their field of expertise. They are people and companies others trust to be credible, have vision and – most importantly – provide answers to their questions or solutions to problems. Online, these sources are our bookmarks, our favorites, the ones that take just a few letters in our URL bar. They’re places we go for technical advice, enlightening information, industry updates or surefire recipes. They’re the places we go with confidence of good results. Before you can position yourself or your organization as a knowledge leader, however, you have to know you’re attempting to lead. Like all things PR, it starts with the audience, understanding their businesses, their values and needs and what will resonate with them. Thought leadership, however, also requires introspection, that is, knowing your own organization and the knowledge equity you most likely already have amassed. And don’t be afraid to take risks, whether it’s with infusions of humor or a unique view of the future. Those are the kind of things that come up in normal conversations and should come up here. As I told my audience at the presentation, this may be a lot easier than they think, as they – no matter where they are in their careers – and their organizations – no matter the stage of their evolution – already have a wealth of experience, passion and knowledge that probably isn’t being promoted to its full potential. 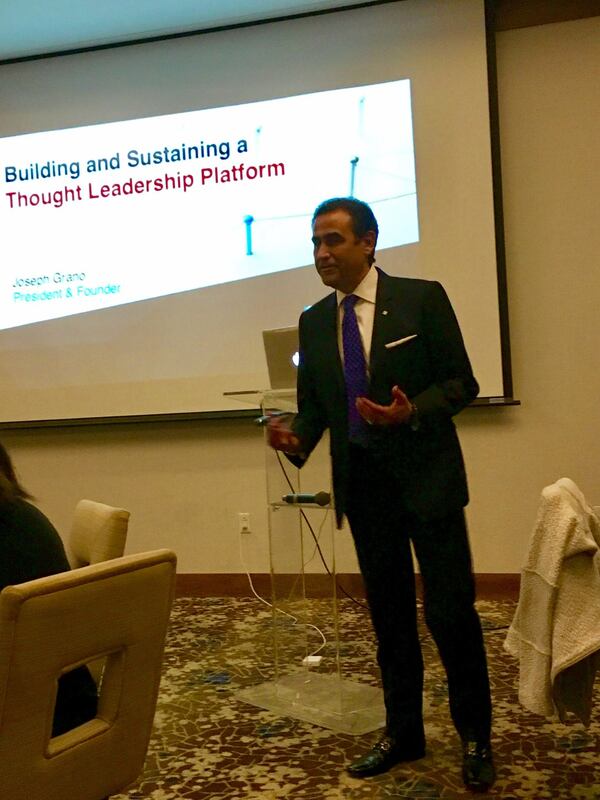 Understanding those resources is the first step in building a thought leadership platform. The next step is determining your core messaging. Opinions may vary but core facts do not. When creating such a platform for our clients, we take a hard look at what they’re saying about themselves, what others are saying about them and what competitors say in comparison. Then we establish a common language, with the proof points, to help guide us and our clients going forward. A critical part of this is getting your current communications up to date with who you are now. It continues to amaze how many organizations have outgrown their messaging or are delivering conflicting information in different media. This creates the most substantial roadblock to a thought leadership content management strategy. Once you know whom you’re talking to and what you want to tell them, you can tap into that deep well of expertise to build an arsenal of thought leadership assets and choose the right medium for its distribution, aiming at the heart of clients’ and prospects’ share of mind. And, remember, as communications visionary Marshall McLuhan said a half century ago, “the medium is the message.” That is, the form of a message has influence on the ways in which that message will be perceived. Decades later, it has never been more true, as there are now so many outlets and likely no one uses them all. However, whatever the medium, emails to white papers, eBooks to video, checklists to FAQs, you want to be your target audience’s source of knowledge whenever they think about . . . you fill in the blank. Provide the type of information a reader will want to pass on or comment about to others. Is it worth all the work? Absolutely. A strong thought/knowledge leadership program creates an affinity for your brand, enables your content to start a conversation early in the consumer journey and develops a higher level of intimacy with your audience. There are, of course, many ways to measure the success of your content management program, such as online metrics, open and response rates, page hits, etc. It is also important, however, to take note of both formal and informal conversations about your brand – listening to, learning from and taking the pulse of, your clients and prospects. Before leaders set out to promote their images and their companies’ messages, they need to control the original content around their brands. By focusing on thought leadership, you can surround yourself and your audience with the right kind of content – content that’s valuable, educational and engaging. As thought leadership continues to grow in popularity (and as the base of successful public relations strategies), agencies will need to adjust their budgets to allow for greater thought leadership development and execution.